Kate Jenkins pushes the envelope when it comes to fiber art possibilities. She doesn’t just knit and crochet, she knits and crochets. A former designer for fashion lines like Donna Karan, she is the owner of Cardigan, a knit and crochet shop and gallery all in one, based in the U.K. Her mission statement unravels like this: “anything can be created from yarn as long as it is made with love.” From striped wraps to fish and chip platters, dragonflies to the pork pie you see below, Kate exhibits at galleries and art shows all over the world and is known for her attention to small details and use of vibrant colors. Most recently, Come Dine With Kate debuted at the Rebecca Hossack Art Gallery in London to hungry eyes. 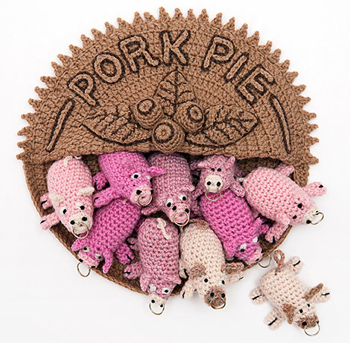 The exhibit features over 80 of her original creations, including sparkly crocheted anchovies, a beef wollington wearing boots, a candelabra with real lights, and a whole slew of fruit tarts. If you can’t make it across the pond, check out the exhibition slideshow to get your fill. What are the most “out there” items you’ve come across in crochet, either from your own projects or those of others? Any “I can’t believe someone crocheted that!” moments? This entry was posted on Tuesday, July 20th, 2010 at 12:13 AM by Alicia Kachmar	and is filed under News. You can follow any responses to this entry through the RSS 2.0 feed. You can leave a response, or trackback from your own site. This is so sweet, just luv it!!!! Wow, not sure I’ve seen the poo pattern! Love the pork pie! I love pig things. Oh wow, this pork pie is brilliant. Wow, this crocheting at its best. I love the expressions on the piggies faces. My favourite weird crochet things are a garden hose and Bikinis. The later getting wet and soggy and heavy. This woman is fantastic! What a sense of humor…and the detail in incredible. I especially love the shrimp canape and the tin of anchovies! How about giving this pork pie a boost by calling it a tortiere(canadian meat pie-special for holidays) and add a cute little curled moustache? i would suggest this for Canada day, but some canadiens are sensitive about the french connotation. I think it would be cute and you won’t see this just anywhere! !